Xiaomi doing what they know how to do best. 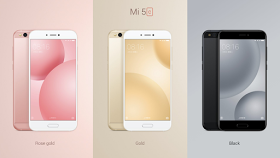 They just launched another Mi series of Xiaomi called Xiaomi Mi 5c device. The smartphone happens to be the first Xiaomi product to feature the new in house made Surge S1 chipset. The smart phone has a 5.15 inches body and was manufactured to run on the latest Android 7 Nougat OS. Xiaomi was loaded with a 3GB RAM and also a whooping 64GB internal storage (ROM). Read on for the full specification of this device.